Sen. Elizabeth Warren (D., Mass.) earlier this week sent out a fundraising email in which she praised the woman who accused Supreme Court nominee Brett Kavanaugh of sexual assault while soliciting donations from supporters. Christine Blasey Ford, a professor of psychology at Palo Alto University in California, has accused Kavanaugh of drunkenly pinning her to a bed, groping her, and trying to stifle her screams at a high school party in the early 1980s. Kavanaugh has denied the allegations, as has his former classmate Mark Judge, who Ford claims was also in the room at the time of the alleged incident. "Christine Blasey Ford has done a brave thing in coming forward. 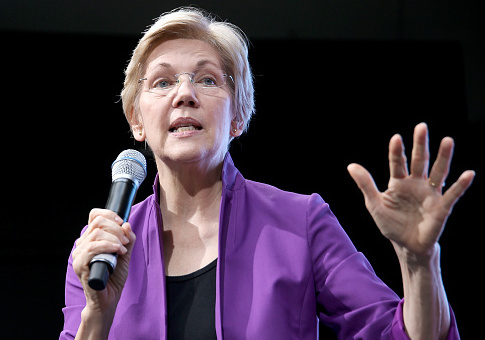 She deserves to be heard and treated with respect," Warren wrote in her email, according to the Washington Times. "Now it's the Senate's job to make sure that happens." The Boston Herald also reported on a fundraising email that Warren sent to supporters. "This is outrageous. Brett Kavanaugh was already disqualified to serve on the Supreme Court. But now we're learning new information about a sexual assault allegation," the email read. "If we all get in this fight right now, from Boston and across the country—then we've got a fighting chance at stopping the Republicans and Kavanaugh in their tracks." The email linked to an online petition, but primarily featured a large red "Donate Now" button below the note. It is unclear whether the Herald was referencing the same email as the Times. The Senate Judiciary Committee has scheduled a hearing for Ford and Kavanaugh to testify on Monday. Ford also has the option of being interviewed in private if she prefers. Ford's lawyer, Debra Katz, has said that her client is prepared to testify next week, but that Monday is "not possible." Katz added that Ford wants the FBI to conduct an investigation into her allegation before she testifies, despite the alleged assault not being a federal crime. Senate Democrats have also called for an FBI investigation into Ford's allegation; the White House has indicated it will not ask the bureau to look into her claim. Warren, who is up for reelection this year, has been floated as a potential 2020 presidential candidate. CNN listed her last week as the Democrat most likely to get their party's presidential nomination in 2020. This entry was posted in Politics and tagged 2018 Election, Brett Kavanaugh, Elizabeth Warren, Supreme Court. Bookmark the permalink.